Halloween is tomorrow, and I have spent the weekend cramming in all things Halloween to celebrate! I took my children to a Zoo Boo event at our local zoo, to see the animals and trick-or-treat. It was fun, but soooo crowded! 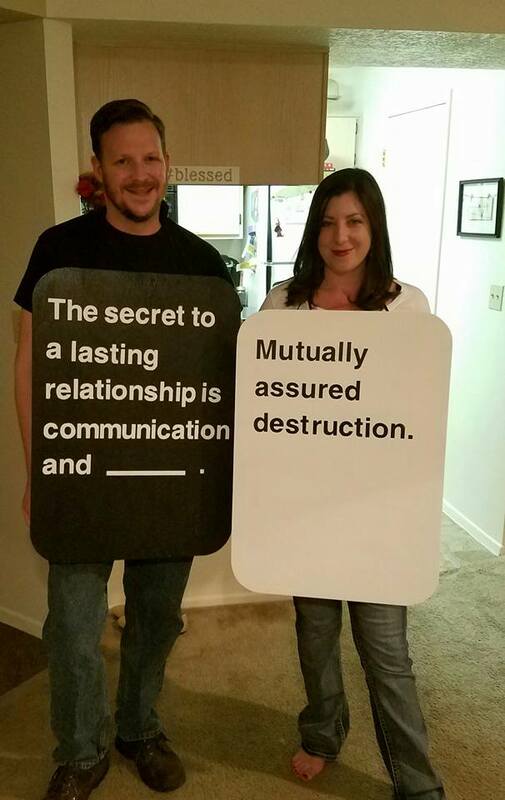 Yesterday evening, my boyfriend and I went to a costume party dressed up as Cards Against Humanity. 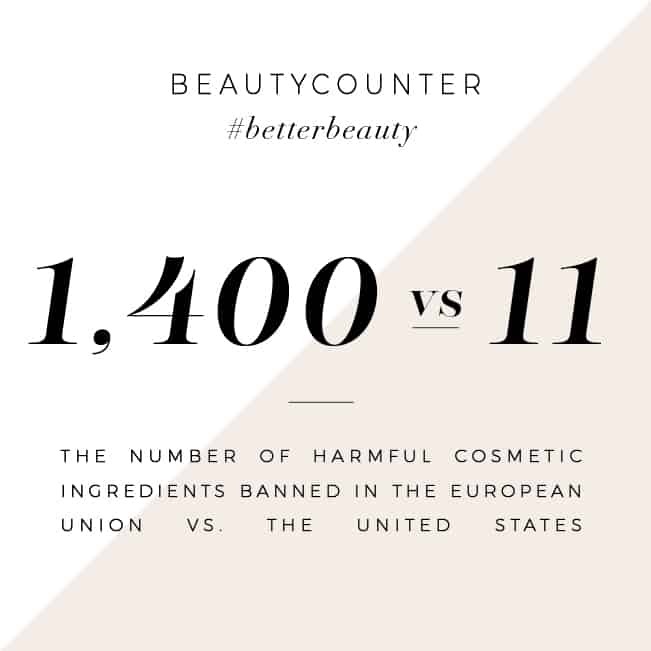 If you haven’t played Cards Against Humanity yet, you need to check it out! This morning, we took the kids to a pumpkin patch. They had a blast! 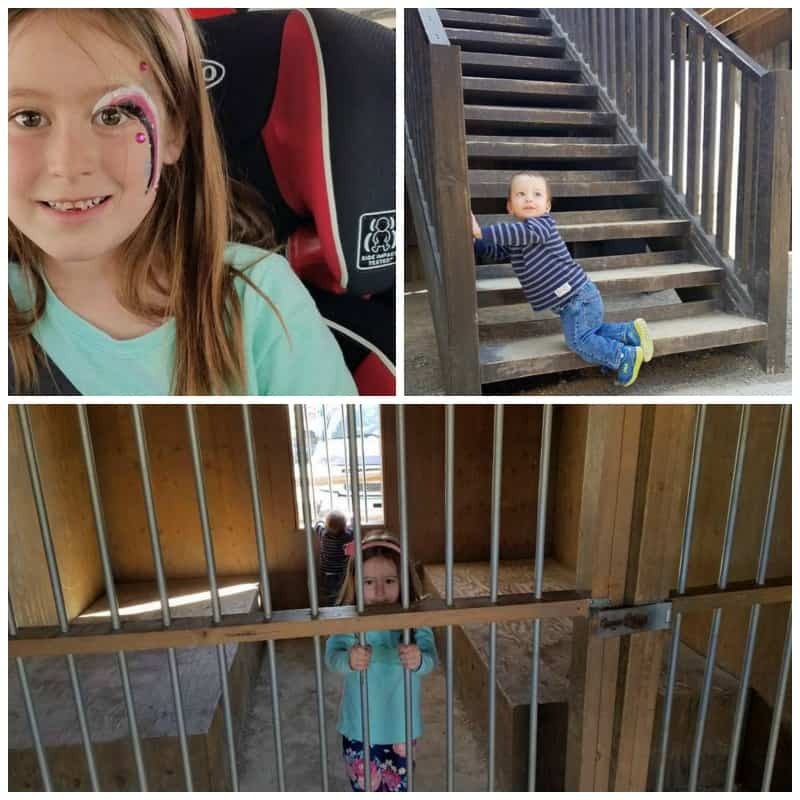 My daughter got her face painted, my son found every dangerous scenario and tried to conquer it, and then we got to lock them up in a fake jail for a while. When we got home, I remembered my work is having a Halloween potluck tomorrow, and I signed up to bring deviled eggs. I decided to roast an orange bell pepper, puree it, and add it to the egg yolk mixture to give it an orange tint. 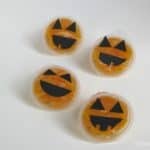 Then I added some sprigs of chives to turn them into jack-o-lantern deviled eggs! These were easy to make and inexpensive. I picked up all my food supplies at Trader Joe’s, and spent less than $5 for 24 jack-o-lantern deviled eggs. I expect they’ll be a hit at the potluck tomorrow! 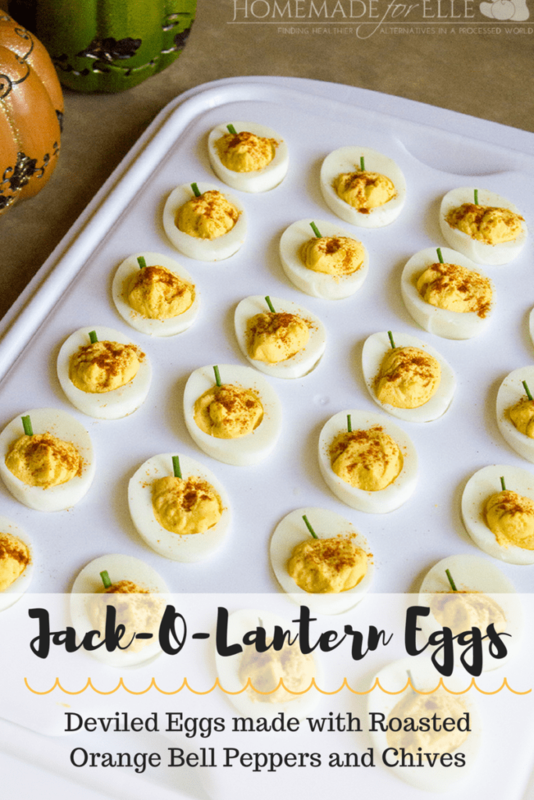 The addition of the roasted bell peppers adds a sweet note to the eggs, which gives the jack-o-lantern deviled eggs a balanced flavor. I got this party platter, which is perfect for transporting deviled eggs and muffins. 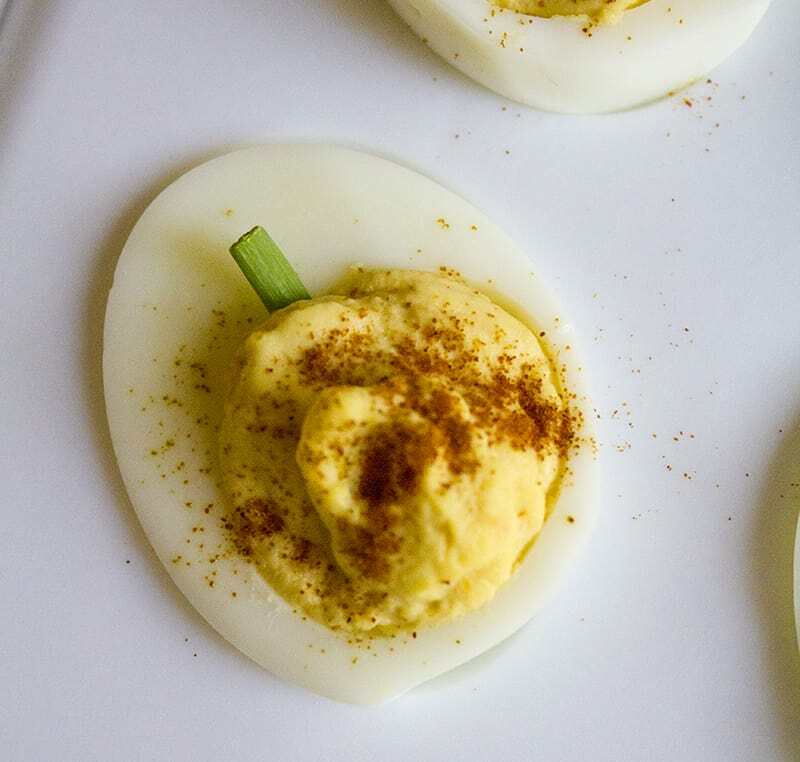 Transporting deviled eggs has always been a challenge, so I love this platter with its nested holders. Bring a large pot of water to a boil. Add in eggs and boil for 10 minutes. Remove and let cool. Preheat oven to 450 degrees. 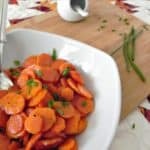 Place bell pepper directly on oven rack, and roast for 5 - 10 minutes a side, rotating when the skin is starting to brown. Remove from oven, and allow to cool. 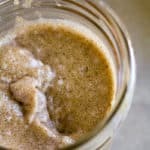 Remove the skin, stem and seeds from the pepper, then place the flesh of the pepper into a food processor. Blend until smooth. Once eggs are cool, remove the shell, and cut each egg in half, vertically. Remove the yolk, and place in a bowl. 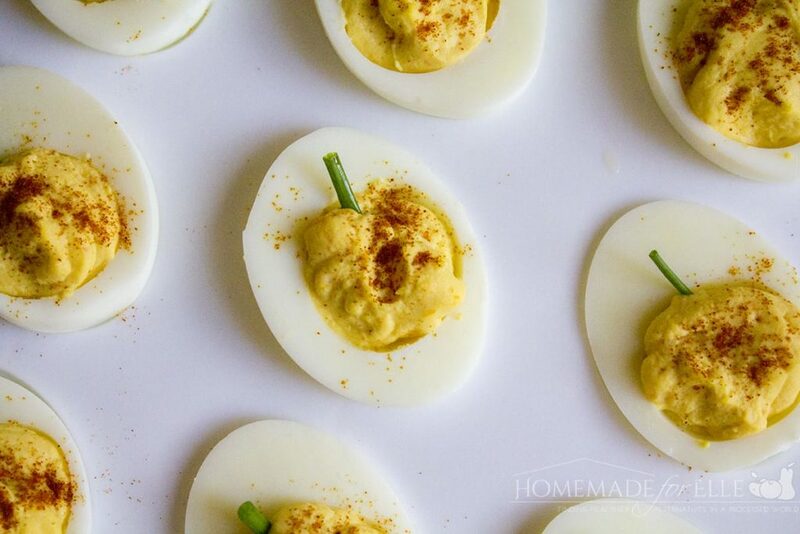 Once all yolks are removed, add the pureed pepper, mayo, mustard and salt. Use a bowl to mash the yolks, and stir until well mixed. Transfer yolk mixture to a sandwich bag, cut a hole in the tip of one corner, and pipe the yolk mixture into the halved eggs. Sprinkle the yolks with paprika, then insert a small slice of chives to the top. 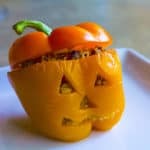 If you’re looking for other fun Halloween food ideas, check out these posts!